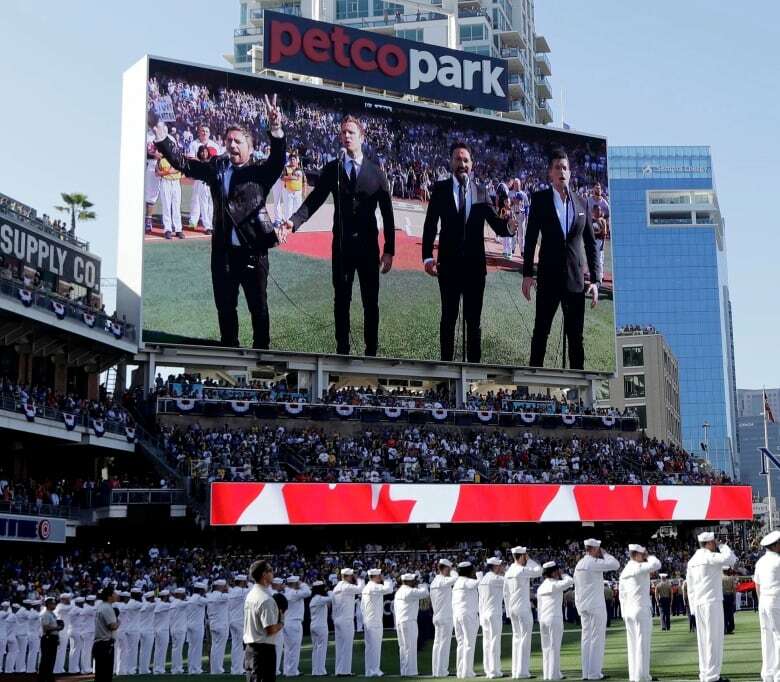 Two members of The Tenors said Wednesday night they are still in shock over the national anthem controversy that erupted 24 hours earlier at baseball's all-star game. "It's been a living nightmare," said Victor Micallef in an exclusive interview with Ian Hanomansing on CBC News Network. The group quickly issued a statement late Tuesday night assigning blame to member Remigio Pereira for altering the O Canada lyrics to include the phrase "all lives matter." He also held up a small sign expressing that message. The statement indicated Pereira would no longer perform with the quartet until further notice. "I don't think we can see ourselves performing with Remigio again," said Fraser Walters when pressed by Hanomansing on whether Pereira was gone for good. Walters, a Vancouver native, said he was sorry "that sacred anthem we hold so dear was compromised." He said Pereira "took it upon himself to take a political stand and it was something he decided to do alone." The Juno Award-winning group has released four albums, mixing their operatic vocals with pop music, having covered songs by Bob Dylan, Elton John, Bill Withers and Queen. The group also includes Clifton Murray. Walters and Micallef said the fallout has been difficult, as they consider themselves ambassadors for Canada and have performed the anthem "hundreds of times," including at other sporting events and for Queen Elizabeth at Windsor Castle. Walters said they felt "shattered" that years of hard work poured into their careers, beginning with a tour of small towns in Saskatchewan in 2008, was threatened in an instant. Mere minutes earlier, they had been revelling in the opportunity to mingle with baseball's best and sing at the game at Petco Park in San Diego. Rehearsals at the ballpark went well, they said, with no indication of what would occur hours later. The substituted lyrics replaced what was usually a French verse sung by Pereira. "If you were a fly on the wall you would have seen three very, very angry guys in the room talking to Remigio and him saying, 'Well, if I asked for permission, you would have said no,'" said Walters. Pereira defended his actions in posts on Twitter and Soundcloud, which he said were meant to evoke "love, peace and harmony." "I've been so moved lately by the tragic loss of life and I hoped for a positive statement that would bring us ALL together," he tweeted. The term "all lives matter" has become particularly controversial because it's seen as a response to the Black Lives Matter movement, which campaigns against racism and police brutality directed toward the black community. "The principle, all lives matter, is of course something that we all strive for. But we have to be honest with ourselves. Take a look at what is happening in society. Do all lives really matter when the police can kill black people with impunity? No, they don't," Sandy Hudson, co-founder of the Toronto chapter of Black Lives Matter, told CBC News. Micallef, from Toronto, said they are experiencing a range of emotions as it pertains to Pereira, whom they shared a stage with for years. The fallout continued Wednesday for Pereira, who had a show at a London, Ont., theatre cancelled. He was to perform with renowned guitarist Pavlo in late September at the Aeolian Hall but the venue said it's "an organization which embraces diversity" and would not "present or allow groups or individuals to use our facilities who either intentionally or unintentionally promote racism."